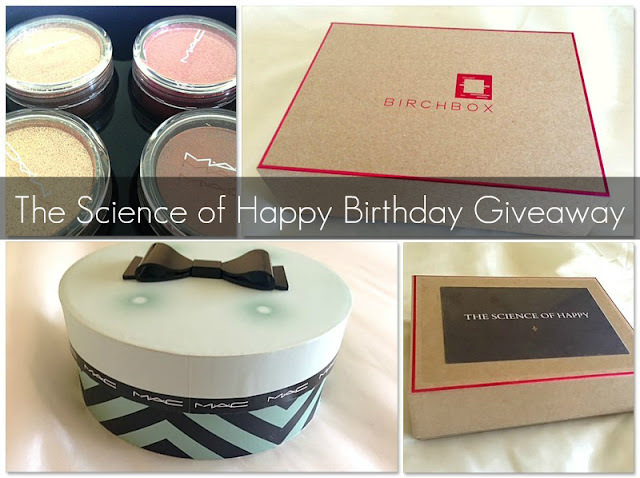 March Birchbox: Great if you're considering subscribing to a sample box, changing existing boxes or just want an opportunity to try out more luxury samples. If you already have the March Birchbox, you may discover products that weren't included in your particular box. The Science of Happy Sample Box: I have compiled an one-off exclusive The Science of Happy sample box containing an array of products for you to enjoy including sachet samples and a few full size products. MAC Guilty Passions Warm Crushed Metallic Pigments: From one of the more recent collections, this is a brand new limited edition MAC Guilty Passions pigment set containing Silky Stocking, Darling Coquette, Ever Elegant and Rose Light, beautifully packaged in a circular mint and black chevron-patterened box and decorated with an adorable black acrylic bow. Giveaway ends on the 6th May 2013. I am not responsible for any damages caused in transit but will do my utmost to ensure the protection of prizes. I am not responsible for any additional charges incurred (customs charge etc) so be sure to double-check your country can receive these prizes. All prizes are sent via UK Recorded Delivery or Airmail. All winners will be notified within 24 hours from the end of the giveaway. Any winners who fail to reply with an address after a week will lose the prize and it will be awarded to someone else. Mario was actually a carpenter before he became a plumber! I came here from Blogger Birthdays to wish you a Happy Birthday! And I see a lovely giveaway :) how nice. Hope your day is great. I've entered! Thanks for this lovely giveaway - great blog too, and hope you had a very happy birthday! I'm sure you've achieved a lot more than you give yourself credit for! Last contest I won never sent the prize, so I'm hoping things work out better this time. My prize from the last giveaway I won never came too :( It's a shame because the prize was suppose to be revlon lip butter and a surprise. Now I'll never now what was there. Seems like a common occurrence! I wasn't aware so many of us were being scammed by these bloggers/companies. It's not right at all :( That popular blogger I mentioned, I'd caught her out for buying and selling fake MAC which we all know is dangerous. So she didn't send my prize! I also won a nail polish but i never received it too :( I don't know whether she sent it and it got lost in the mail or was it all a lie . Weel I hope be lucky this time! Your blog is gorgeus sweetie!